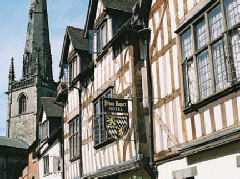 Completing the triumverate of special places to stay in the historic town (along with The Lion Hotel and the Catherine of Aragon Suite), this truly stunning part-12th century and part 15th-century building was formerly the home of Prince Rupert, grandson of King James. Unsurprisingly, the house is Grade II* listed and largely of timber frame construction. Boasting 70 guest rooms in all, The Prince Rupert is ideally situated for those seeking to explore what heritage-rich Shrewsbury has to offer, including the Castle and museum. The property also features two restaurants, a health club and a bar.